After completing my studies, I started working for Plymouth University in the School of Architecture, whilst simultaneously looking for job opportunities. Even though I got offered jobs within well-established practises, I felt something was missing in all those opportunities compared to what I could be offered. I felt that I could contribute to the growth of a practise with all the professional experience I had gathered. 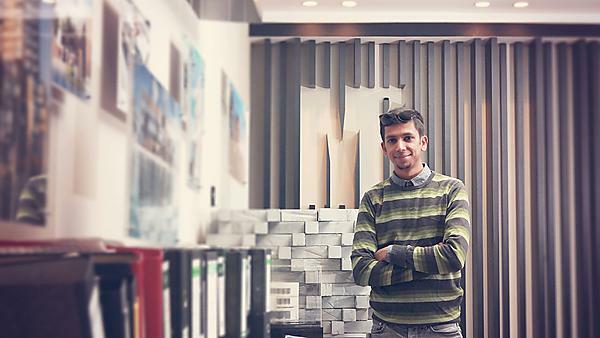 At this point I took a risk and joined M2H Design Studio, a young and upcoming design and engineering practise in the Middle East at that time. This was one of the best decisions I have ever made in my career because it gave me the freedom, confidence, and resources to explore my potential, ability, interests, and improve my skills. I was also allowed to improve the team which in turn led me to the position I’m currently occupying. Moreover, it helped me to form my own alliance, CODE Atelier, which consists of architects, product designers, curators, and graphic designers etc. from around the world who are dispersed geographically. Since graduation, I have designed, managed, and realised a great amount of projects ranging from villas, high rise towers, commercial buildings, urban regeneration projects, master-planning projects, and furniture designs. Architecture is one of the most competitive fields. You will experience this competitive nature during your education as well as when you step out into the real world. Competition should not be taken as an opportunity to defeat someone, but to improve yourself and to push yourself a bit beyond where you stand today. Competition should be the nitrous oxide for your engine, which gives you additional energy to improve your performance. Never forget to offer your helping hand and to carry others with you, so that you will see competition within you disappear and turn into strength. This reveals a wonderful purpose and a meaning to all the design work you do. Studying at Plymouth helped me in many different ways. Firstly, it helped me to widen my knowledge of architecture through a very well laid out programme. Secondly, it helped me to redefine and refine my architectural agenda by letting me explore my own interests and abilities. Thirdly, it helped me by providing me with tools and the confidence to face challenges, situations, and then react and respond sensibly. As a person originating from Sri Lanka, obtaining an educational qualification from a well-recognised British university helped me receive international recognition. My degree has influenced potential employers to hire me because Plymouth has placed me amongst a cohort of qualified candidates in the job market. Even today, it really helps when dealing with clients, as they really look into your educational background prior to deciding if they want you to be the one who designs and handles their project. My favourite memory is from the studio. I can never forget how much I enjoyed working long hours in MArch studios surrounded by likeminded individuals sharing thoughts, ideas, and dreams. That space was full of beautiful, creative energy and passion that became the driving force which led each one of us to produce beautiful pieces of art – to one day, perhaps, make a great contribution to everyone’s lives. Of course: yes! Plymouth consists of very professional staff who are very resourceful, who understand you well and have the ability to guide you towards achieving your goals. Also, Plymouth University has almost all the necessary facilities that a student could need to successfully complete any area of study.